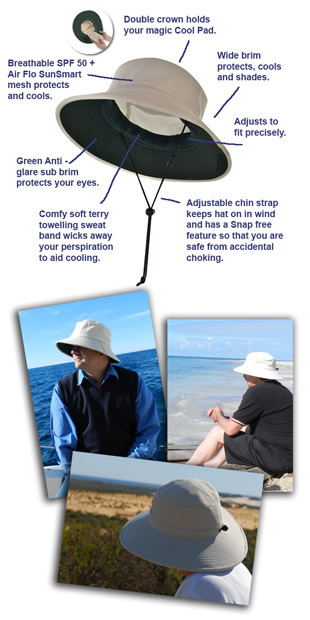 The EveryDay Cool Hat is the coolest way to make your summer-fun be pain free! Sunlight-induced advanced aging and skin cancers are increasing in many areas of the world, and this concern shouldn't be overlooked. TheEveryDay Cool Hat will not only protect you from the UV light, but also make your next outdoor adventure cooler and more enjoyable. Wide downsloping brim to protect your face yet keep your vision unhindered. Wide brim holds its shape perfectly. Wide foam core filled brim that will float if dropped into water. Double crown in which to place your Cool Pad, that comes free with your hat. Magic removable cool pad to keep you cool. Lightweight, breathable mesh crown allows flow-through venting to cool you down. Water Repellent, SPF 50+ fabric protects you. Comfortable, terry towelling sweat band keeps the sweat off your brow. Adjustable cord and chin strap with cord lock to keep it in place in the wind. Cord has an inbuilt Safety Snap that snaps apart if the chin strap gets caught, thereby protecting you from choking. Dark coloured underside offers anti-glare protection to aid visibility. White, Navy, Natural Beige and Natural Rattan. We can now supply promotional Cool Hats, embroidered with your logo (minimum of 100). Throw your EveryDay Cool Hat into the washing machine.